Hydrolysed whey protein concentrate in a specially patented formula OPTIPEP®, which has a remarkable solubility and absorption rate by the body. Deliver a najwyższeh quality of building materials! 203 loyalty points Your cart will total 203 points that can be converted into a voucher of 8,12 PLN. FA Diamond® HYDROLYSED WHEY PROTEIN is a hydrolyzed whey protein concentrate in a specially patented formula OPTIPEP®, which has a remarkable solubility and absorption rate by the body. It provides unique in operation and enzymatically digested protein in the form of polypeptides, di and tri peptides and free amino acids. 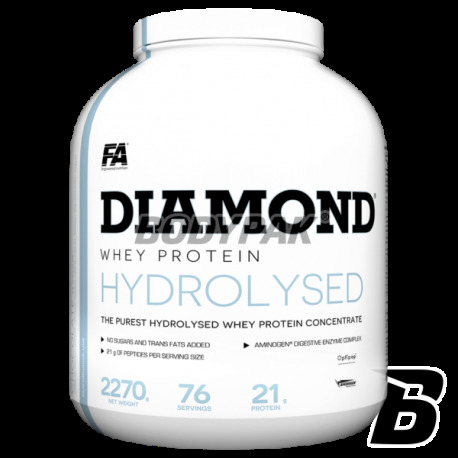 FA Diamond® HYDROLYSED Whey Protein is an excellent quality product based on high-protein concentrate of the highest quality hydrolyzed whey protein. FA Diamond® HYDROLYSED WHEY PROTEIN has been obtained in non-acidic and enzymatic hydrolysis carried out by digestive enzymes make up the complex AMINOGEN®. This means that during production OPTIPEP® all of the input proteins were digested by the active enzyme, which makes the product very rich in digestible and easily absorbed and dipeptides and tri other amino acids. As a result of the pre-digestion Diamond® HYDROLYSED WHEY PROTEIN contains polypeptides, whose presence is very desirable during the post-workout muscle recovery. The presence of di and tri-peptides provides a constant positive nitrogen balance in the body, which stimulates anabolism and protects muscles from catabolic effects of cortisol. Each serving of the product provides 22 grams of protein (a peptide), which contributes to growth and helps maintain muscle mass and helps to maintain healthy bones. 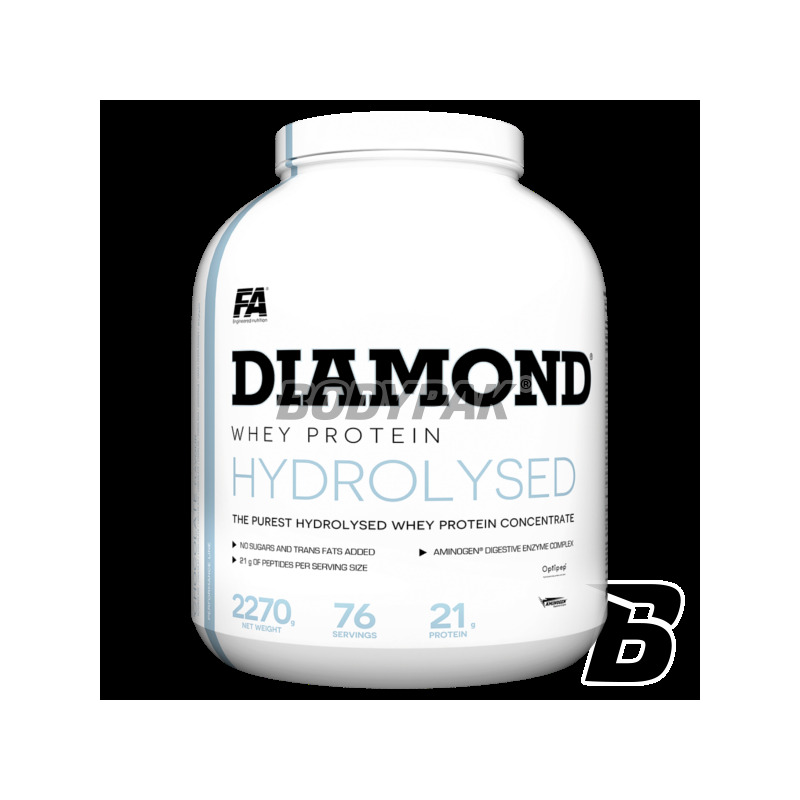 Excellent quality Diamond® HYDROLYSED WHEY PROTEIN results also from a special high-tech production method. A protein concentrate prepared by means of ultrafiltration with a spiral membrane to preserve the unique quality of the product and all valuable proteins to the human body. REACH FOR QUALITY, REACH FOR STRENGTH - REACH FOR Diamond® HYDROLYSED WHEY PROTEIN! Składniki: OPTIPEP® [hydrolizat białka serwatki (z mleka), emulgator: E322 (lecytyna sojowa)], kakao1 , aromaty, barwniki (E160a4,6,9 E1622,3,4,6,7,8,9,10; E1637,8; E150a11,12); substancje słodzące (acesulfam K, sukraloza), sól. Dotyczy produktu o smaku: czekoladowy1, malinowy2, truskawkowy3, brzoskwiniowy4, waniliowy5, pomarańczowy6, owoce leśne7, waniliowo-jagodowy8, marakuja9, sernik cytrynowy10, masło orzechowe11, kawowy12. OPTIPEP® jest zastrzeżonym znakiem towarowym firmy Carbery Food Ingredients Limited. Smak dopracowany, skład też.. przy czym cena trochę psuje. Jak na hydrolizat to bez rewelacji... w tej cenie to nawet ciężko o dobrej jakości izolat. Piłem czekolade - w smaku dobra, ale ogólnie w działaniu szału nie zrobiło.